Blue birds like a habitat that consists of orchard trees. Orchard trees are trees that produce fruit or nuts. Blue birds also like a habitat that is near a golf course, or a park. 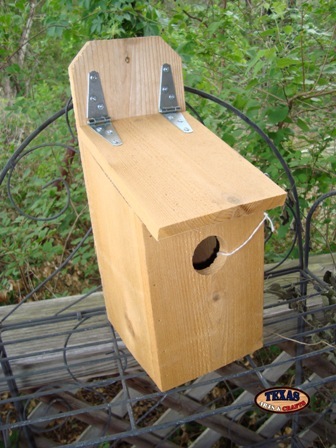 The blue bird nest box should have a hole that has a diameter of an inch and a half because it prevents predators from getting the blue bird and its eggs. Blue birds like it if the bird house is at least five feet up. I recommend placing the bird house somewhere in sight, such as on a fence post or a metal pole, so you can watch and see if a blue bird makes a nest in your bird house. We build the Blue Bird House in our workshop out of cedar. The size of each bird house may vary slightly because it is handmade. The size is 18 inches tall by 5.50 inches wide by 8.50 inches deep. The bird house weighs approximately 7 pounds with packaging. For the continental U.S. shipping and handling is included in the listed price. For shipping outside the continental U.S. please contact us through our Contact Us page. We build the Hinged Blue Bird House in our workshop out of cedar. This blue bird house is hinged for easy cleaning.